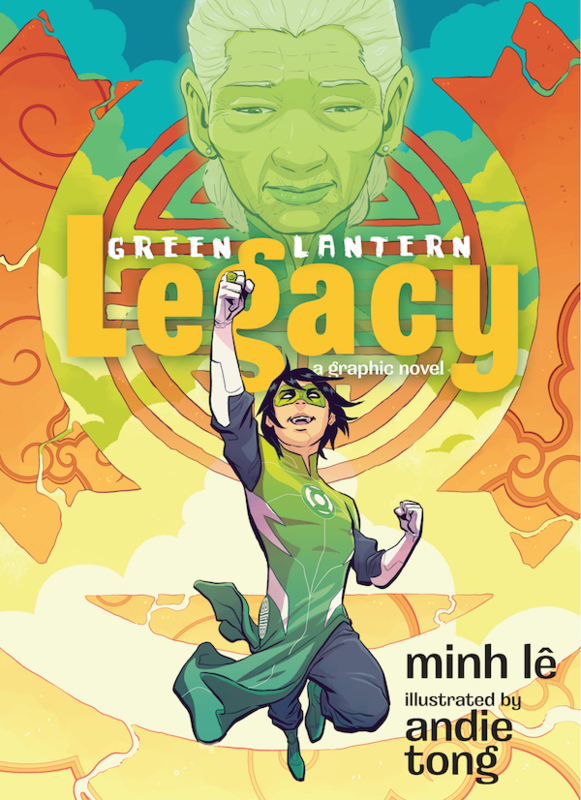 We’re excited today to show you an exclusive first look at the cover and some art for DC’s middle-grade graphic novel Green Lantern: Legacy, along with some comments from writer Minh Lê and artist Andy Tong. The book is part of the DC Zoom middle-grade imprint, which, together with the DC Ink young adult imprint, will feature standalone graphic novels by well known creators that offer new twists on iconic DC characters. “I grew up loving mythology and superheroes, so being an official part of the DC world is a dream come true. In fact, if I went back in time and told junior high me that I’d get to write a Green Lantern comic, he’d be doing backflips. Or fainting. Probably both. “I loved having the opportunity to add new characters to the already rich Green Lantern universe. While I wanted to take advantage of the intergalactic potential of the Green Lantern universe, I also wanted to make this a story about family and community. I’ve always loved superhero stories that make us think about the actual heroes that walk among us… which is why this story begins with a character inspired by my own grandmother. “Tai, the main character, is a young Vietnamese American superhero and I’m so grateful that I was given the opportunity to create this character. Growing up, I was used to Asian characters being the sidekicks, so it means the world to me that Tai gets to take center stage in this story. Tai is much bolder than I was at his age, but his struggle to figure out how to wield his newfound powers is one that I hope will resonate with young readers. “One thing that I hope that readers walk away with is a greater appreciation for the heroes in our own lives, particularly those within our families. When you come from a family of immigrants and refugees as I do, it can be incredibly humbling. Nothing puts your own problems into perspective like considering the harrowing journeys your loved ones took to get where they are today. So it was with a lot of humility that I set out to write a story that honored that kind of heroism. “I’m very excited about getting to introduce a whole new Green Lantern character. It’s been such a rewarding experience to be able to conceptualize him from scratch and bring him into the DC universe. “I was trying to make the artwork light for the target audience and not too heavy in shadows and darkness. It was a great team effort between myself, Minh, our colorist Sarah Stern, and DC editor Lauren Bisom to help make the artwork pop and shine for young readers. “First and foremost, I hope fans have fun reading and looking at the artwork. At the same time, Minh and I incorporated several cultural components that we grew up with in our respective Asian households—details as seemingly small as making sure no one wears shoes inside the house—and I hope the readers appreciate it! I could enjoy this as an Elseworlds story. My eyes are glazing over at the mere thought of adding YET another human Green Lantern to the mythos. I certainly don't need it. But I really dig the writer's attitude and approach to the whole thing. If DC pushes this as a non continuity Elsewords type of thing, I think it HAS a place in the GL franchise. Sounds cool. Asians don't get enough love in American comics. From what I've seen of the other middle reader books, these seem to be in their own continuity. I don't think they even intend for them to go on. Yea given that the target demographic for this is 8-12 year olds I can't see this being in the main continuity...unless of course it's a runaway success, in which case all bets are off. Well DC's blurb for the one they're doing on Super Sons said the writer was given full freedom to make up their own world so it's not even Damian that's the son of Bruce in that book, but a new character. Anybody else get the feeling from that description that they are going for a sort of Kyle Rayner vibe (young artist, becomes a GL unexpectedly, insecure at first as a hero), but multi-cultural from the beginning instead of having it awkwardly tacked on later? Last edited by Mister Ed; 03-14-2019 at 02:37 PM. Won't lie...I'm not so thrilled with the art here.